My Romantic Home: I painted it! 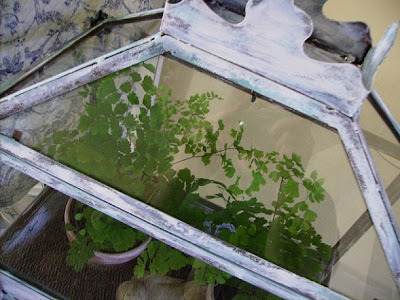 Remember this cute glass house I bought at a garage sale for $5.00? I decided to paint it white. I didn't want to just spray paint it white because I wanted it to look old so I used Rub N Buff in Antique White and Patina (I let some of the rust stay). This took FOREVER to do and I think I sanded off my fingerprints on my right index finger. I tried rubbing it on with a rag but it just works so much better with your finger tip. The glass was easy to take out but putting it back in was a nightmare. I broke two corners off try to get it back in. Yep, that's two things I broke last weekend (see Monday's post) After I finally got the glass back in, I realized that I had the whole thing upside down (this thing has three separate pieces) and if I had it right-side up the glass would have slid right in. Oh well, someday I'll get a new piece of glass cut for it but for now I just put the broken side against the wall and you can't even see it. I also put some white Rub N Buff on the little terracotta pots. As usual, it looks a lot better in person that in these pictures. Below is the "before" picture. I like it so much better white. You're right. It's much better white. It looks softer and more in keeping with your home. Cindy, that looks so cute! I love it white for your house. I have some white Rub N Buff too & used it on my iron birds. Love that stuff! This turned out so cute! Don't worry about the broken parts...they actually give the pieces character! Cindy,where do you get your rub n buff? Joanns has quit carring it and Michaels has a small selection of it. Excellent!!! Very pretty and I'm sure worth all the effort because when you look at it you will smile. And so did I when I saw it!! Gosh, that was fast work! The white is perfect for that piece. Too bad about the corners, but as someone else said, it adds character. Cindy you have been tagged!!! Come and visit my blog for more information!!! It looks fabulous! I like it better white also. I've never heard of Rub N Buff. I'll have to look for some. Your thirft store table redo is great too! Cindy, it looks wonderful...just perfect for your home! You were right, the white suits you best. I'm so pleased for you---it's a beautiful addition to your home. That is awesome! I used to use rub and buff on metal a lot... I love the texturing you can do with it. I love the look of this! Ambition supreme! Cindy, you have a wonderful blog & a real gift for decorating. 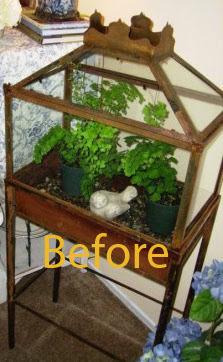 Not to mention good luck ~ I can't believe you got that wonderful old terrarium so inexpensively! Love the white finish. Can't wait to read more of your blogs! Please come visit me, too! Cindy I love it! You did such a good job. Perhaps the sanded finger was worth it as it looks amazing. Ahhhhhhhh!!! It looks lovely...specially next to that table..
That looks so much better! When you originally asked if you should paint it, I wasn't quite sure. But it is much better with the paint. And thanks for the link to the Rub N Buff. I will be getting some of that. They have a great selection of colors. 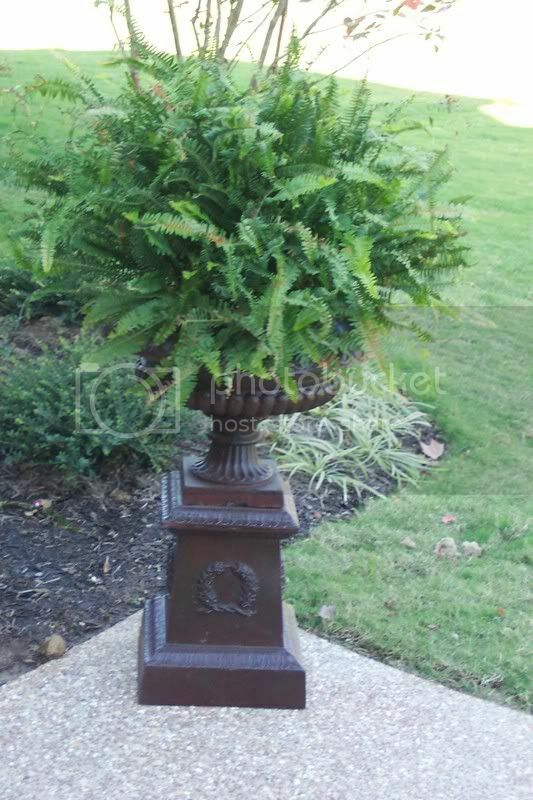 I think I am going to buy some terra cotta pots for my porch table and paint them like you. Thanks! The difference on this is amazing! The white freshens it up so much. I'm going to have to look into Rub N Buff... 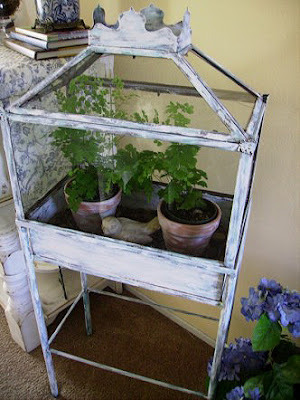 I usually used some American Traditions shabby chic paint kit on my projects, but this looks a bit fresher than mine. Thanks for the info! Love it! Let's go vintage shopping together :) Can you swing by Missouri and get me? ps. I "tagged" you too on my blog! Oh how beautiful! And I've really enjoyed all the other posts and photos of your home. About the rub 'n buff ~ I know what you mean. Several years ago I decided to do a border of cherubs all the way around my living room with gold rub 'n buff using my fingers ~ honestly, I had blisters! But is was so romanticly pretty! You did a beautiful job. It looks great. I have never tried rub-n-buff. I usually paint it all by mixing my colors etc. I should try that stuff sometime. It sounds like fun. Sorry about the breakage but it sure turned out great!